An innovative new publication provides afterschool leaders with practical tools for implementing research-based practices. Student learning doesn't always end when the school bell rings. Afterschool and other expanded learning programs—whether offered before or after school, on Saturdays, or at other times—can help students develop skills and knowledge that may enhance school success. In 2009, SEDL's National Center for Quality Afterschool responded to a growing need for resources to help afterschool leaders develop, manage, and sustain successful programs. With generous support from the C.S. 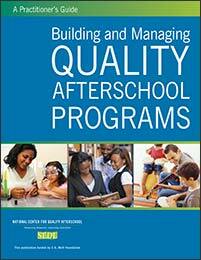 Mott Foundation, the National Center produced A Practitioner's Guide: Building and Managing Quality Afterschool Programs. This innovative guide offers afterschool leaders a practical way to incorporate the wealth of information SEDL learned during a 5-year study of more than 50 high-quality afterschool programs across the United States. Refined through feedback from afterschool practitioners, the publication is tailored to the needs and challenges that afterschool programs face. The practitioner's guide describes the practices of successful afterschool leaders in four key areas: program organization, academic programming, supportive relationships, and achieving program outcomes. The guide also provides two tools: the Quality-O-Meter to help readers reflect on and assess their program's practices, and the Planning for Action worksheet to help them plan and implement solutions. These tools enable practitioners to incorporate the research findings into their everyday operations. "We have learned from our research what a successful afterschool program looks like. Now we have taken that knowledge and translated it into a practitioner's guide that is one of a kind. This approach is a new way of presenting findings that can then be used in the field," says Catherine Jordan, a SEDL program manager and one of the book's authors. The National Center staff are already integrating the guide into their professional development sessions. "The practitioner's guide provides the missing piece of the puzzle," says Joe Parker, a program associate with the National Center. "We are now able to present a complete approach that addresses best practices for developing not only academic enrichment but also the leadership and management needed to support it." 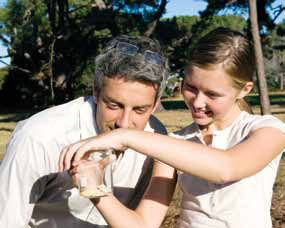 Research shows that children whose parents are actively involved in their education are more likely to earn higher grades, graduate, and pursue further education. SEDL promotes parental involvement in education through the National PIRC Coordination Center. A partnership of SEDL, Harvard Family Research Project, and the Miko Group Inc., the Coordination Center provides the nation's 62 Parental Information and Resource Centers (PIRCs) with technical assistance and professional development. In 2009, the Coordination Center brought together PIRC leaders at its national conference in Washington, DC. Hosted by the U.S. Department of Education, the conference focused on key topics such as statewide leadership and early childhood parent education, and provided new sessions for PIRC financial managers and parent representatives. The Coordination Center also expanded its year-round support of the PIRCs with the launch of a webinar series covering topics related to grant administration and school reform.